March 2015 – on my way: make it someday. 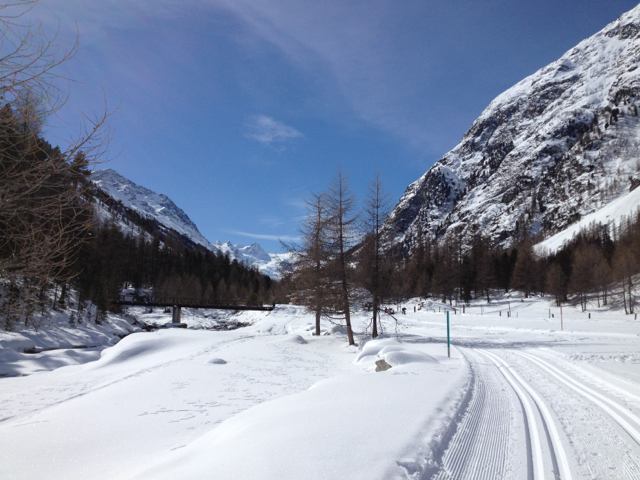 Last weekend I raced in the Engadin Ski Marathon from Maloja to S-Chanf, in the Engadin valley of Switzerland. I wrote up a little blog post about it for the Ford Sayre Junior Nordic Team blog – I raced in their suit, as I did for the first time in, gosh, 2002? 2003? Anyway, go read my blog post here! It was a fun race and I had a fun time writing it up. Besides the race itself and the glorious just-for-fun training ski I had the day before going up the Roseg valley (that’s the photo at the top), one of the really fun things about the weekend was all the people I got to meet and hang out with. I drove down to St. Moritz on Friday night with the Zurich International School ski team, who I’ve been helping coach a little bit on the weekends all winter. They are a super great group of kids and I always enjoy hanging out with them. I also really miss coaching, so it’s nice to get my fix. On this occasion, I drove with Greg Velicer, whose daughter is on the team. He is a great evolutionary biologist (Greg’s own work is amazing, but I will just also mention that he studied with Richard Lenski…), so we spent the drive talking about science, academic life, expat life and… skiing. A lot about skiing. It was really nice to talk with someone about some of the work-life balance challenges I face in trying to maintain an athletic lifestyle, and have them really agree that there’s value in making it work. You can read about Greg’s cool science on his lab website, which describes their research on ecology and evolution of myxobacterial social behavior. After checking out the St. Moritz night sprint with the high school team (just spectating, after we did an easy ski from Silvaplana into town), I connected with Holly Brooks and we headed over to Caitlin and Brian Gregg’s apartment for dinner. They had cooked up a feast and it was a blast to connect with all of Team Gregg, including Brian’s mom and brother, and Elias Bucher, who was working as their wax tech and later gave me and Holly a ride back to Zurich. I had missed Caitlin’s amazing bronze-medal winning race at World Championships by just one day, so she showed me her medal, too! I spent a lot of time with Holly, who has been stopping by my house in Zürich in between stints racing the different FIS Marathon Cup races. She has a great blog about her experiences – she has won quite a few of the races and is the current leader of the Cup, but also is trying to figure out the logistics for some of these trips where Americans rarely, if ever, travel to the races. Her blog is a great mix of athletic stories, cultural experiences, and travel advice. She’s also working towards a masters degree in counseling psychology, and it’s absolutely amazing what she is juggling and excelling at simultaneously. Check out the blog here, or for a different perspective on the Engadin, you can read her post here (Holly finished fifth). Holly also saved my bacon in terms of getting me a ride to the start along with the Salomon team who was supporting her, and sharing her wax box with me so I could wax up my skis to be super fast. Mostly, though, it’s just always fun to hang out with this lady! Holly was staying in an apartment in Samedan, about the midpoint of the race, which had been rented by her friend Tony (pictured with me and Holly at the sunny finish in the photo above!). I was very lucky that there was room for me to stay there too. Joining us was also Sarah Willis, an American who was in Sweden at the same time as me and is now doing a PhD in exercise physiology in Lausanne. Despite all the things we have in common we had never met, so it was really fun to hang out with Sarah. She’s also a super badass mountain running ultramarathon machine. And finally, after the race we met up with a bigger U.S. crew and sat at a picnic table in the Engadin sun drinking beer. 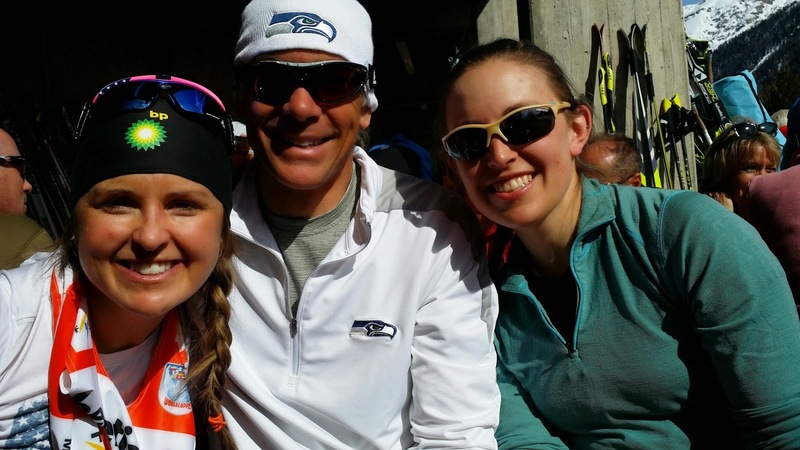 We were joined by Fast Big Dog and his friends, Tony, Team Gregg, and Inge Scheve and Kent Murdoch; I improbably ran into my friend Greg as he was walking by; and some other U.S. elite skiers who had competed dropped by and said hi. It was a really nice weekend of reconnecting with part of my community, and although I was completely exhausted by the time I got back to Zürich (the drive was horrendous, the worst traffic ever in Switzerland), I was filled with a happy glow all week. Hooray for ski racing, skiing, and skiers!